Warmly welcomed and picked up by our Tour guide from the airport and led to your hotel. Firstly, visit to the Royal Palace compound build in 1866 by the Predecessors of King Norodom, is the most conspicuous feature and also one of impressive colorful Khmer-style Palaces. Nearside the Royal Palace is Silver Pagoda (The Emerald Buddha temple), display plenty of Buddha Statues that were decorated and made by diamond, emerald, gold and silver. Travelers will proceed to visit Independence Monument which was constructed in 1954 after Cambodian took their country back from French colony, continuing visit to National Museum, the distinctive red building with a beautiful Khmer architecture was build since 1917 and contains more than 5000 art objects made of sandstone, bronze, silver, copper, wood and others. We will also visit The Toul Sleng Museum of Genocidal crime and Killing Field of Cheong Ek. Departure by car A/C by national road No 5 along the Tonle Sap River, on the way visit the mosques, the fishing villages, the handicraft center of silver at Kompong Luong, continue to Phnom Oudong (former capital), climb up to the top of the hill of Phnom Preah Reach Trorp for visiting the ancient temple and the numerous stupas, enjoy the splendid view in surrounding. 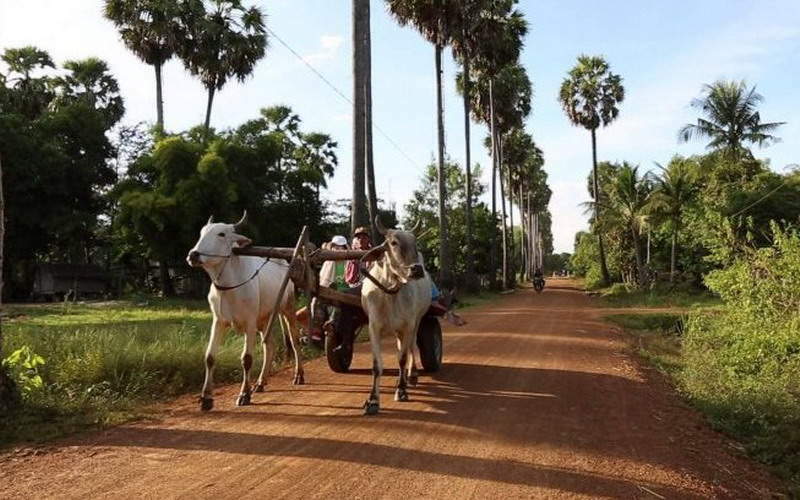 Continuation by the same road through the village, the rice field to Kompong Chhnang province, arrival around 11:30, city tour, visit the fishing village on Tonle Sap, the potteries - Lunch at the local restaurant. Then continue to Battambang via Pursat city with a brief city tour, arrival at Battambang in the last afternoon. Dinner at the city restaurant and overnight. 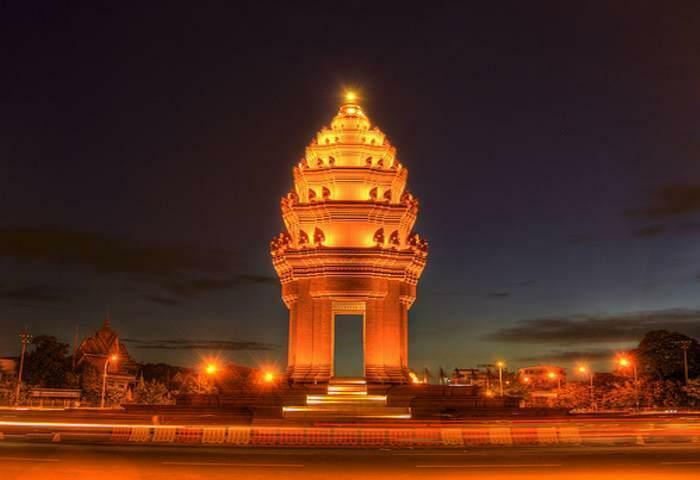 Discover the city of Battambang, a charming big city where you can watch the elegant houses in the French colonial style along the river. You then visit the Provincial Museum and the pagoda before heading to the 11th century temple of Wat Ek Phnom. You pass through traditional villages along the route where you can attend the manufacture of family rice cakes and contacting people about their daily lives. Lunch at a local restaurant. In the afternoon, Then, an hour's ride to the hill of Phnom Bannon (337 steps) and its temple, Prasat Bannon, 7th century, which stands atop mountain that you reach by a long staircase. From there, you can also admire the beautiful scenic landscape of villages, plains, pagodas. Dinner at local restaurant. visit a village which is located on a crocodile’s farm. 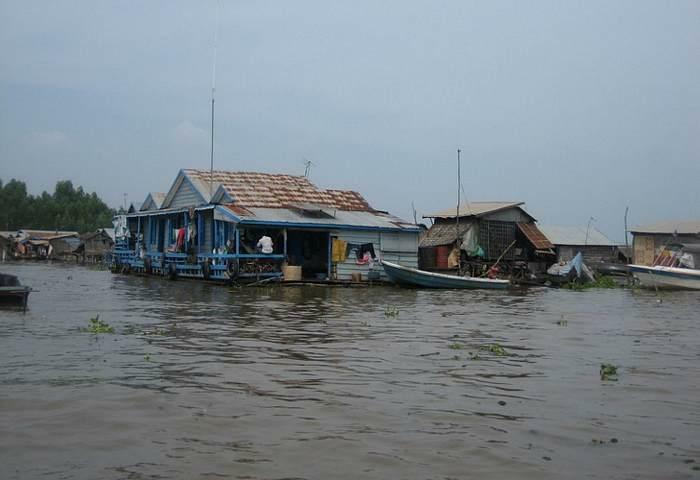 Lunch on the boat and continued cruising to Siem Reap where you arrive in late afternoon. Transfer to your hotel. Dinner at local restaurant with Apsara Show. In the morning visit the South Gate, Angkor Thom, This Royal city was first built under the reign of Udayadityavarman II in the 11th Century, the famous Bayon Temple – this temple mountain built by Jayavarman VII is situated in the centre of the city of Angkor Thom. It is a three-tiered pyramid with its entrance facing east. The central shrine is surrounded by 54 towers all crowned by gigantic faces, representing Lokiteshvara but with the features of Jayavarman VII, Baphuon - This temple built by Udayadityarvarman II was the most poorly constructed of all the temples in Angkor. Phimean Akas – this temple constructed late 10th – early 11th century by Jayavarman V. Elephants and Leper King Terraces. The first owes its name to the outstanding depiction of elephants, while the second gets its name from the magnificent sculpture of King Yasovarman, popularly known as the Leper King. 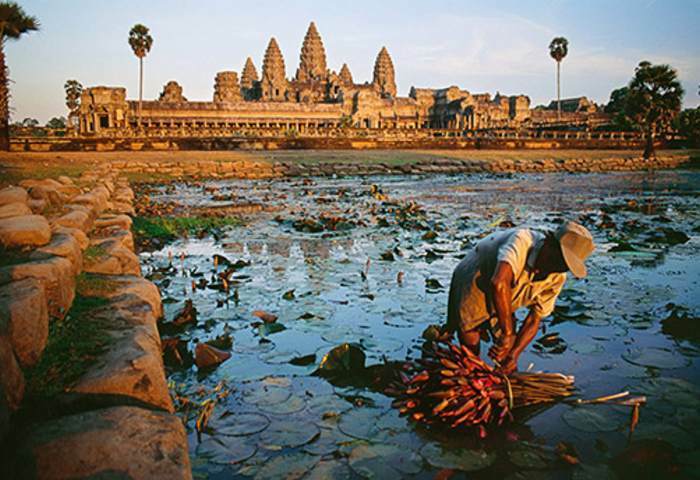 In the afternoon visit one of 7 wonders of the world "Angkor Wat" early – mid 12th century by King Soryavarman II. The temple is one of the largest monuments to religion ever built and is truly one the wonders of the world. 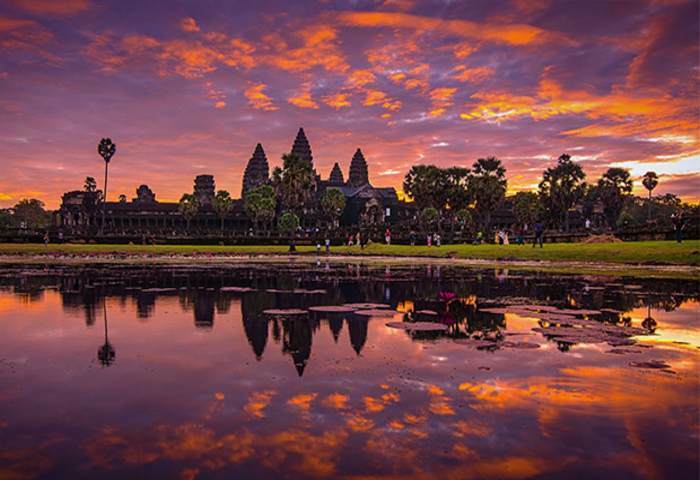 Believed to have been constructed as a temple and mausoleum for King Suryavarman II at the peak of the Khmer empire in the first half of the 12th century, Angkor Wat is probably the best-preserved of the Angkorean temples. And then watch sunset view from the top of Phnom Bakheng. In the morning discover the Angkor temples in the small circuit : Thommanun with some very nice walled-doors and stylized devata, Chau Say Tevoda, Takeo one of the first to be build out of sandstone, Ta Prohm was a monastery built by Jayavarman VII as a residence for his mother, It has been largely overgrown by the jungle and as you climb through the dilapidated stone structures you see many giant baniyan growing out of the top of the temple itself, Banteay kdei, this temple was constructed by Jayavarman VII during the 12th and 13th Centuries ( Citadel of the Cells) used to be a religious monastery, and Sras Srang used for ceremonies and royal baths. In the afternoon, transfer to the airport for flight departure. Trip ends. Please book the tour or contact us at info@indochinatreks.com for a free quote of your trip. Our local knowledged travel consultants will promptly answer your all questions with customized advices to best fit your need. Accommodation in shared double or twin room at hotels selected. Transfers by private air-conditioned vehicle as per program. English speaking guide for each area as per program except during time at leisure. Entry fees for all sightseeing as mentioned on the program. The following video was created by Ms. Jenny who traveled to Vietnam with us in April 2017.